…and what, in all honesty is prettier than this? 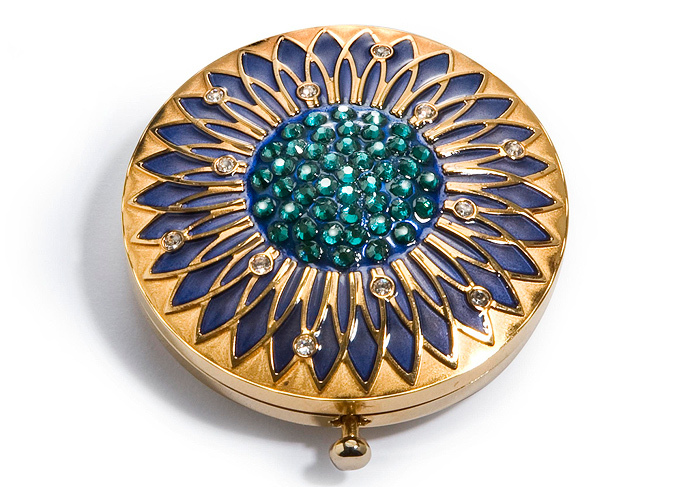 Every year since 1963, Estée Lauder has introduced a collection of limited-edition solid perfume and powder compacts. These delicate pieces enjoy a worldwide following among collectors with their intricate and ornate designs. Nothing speaks to Estēe Lauder’s great legacy like these treasured collectables. These exquisite miniature designs are available to collect and cherish. Each enamel and sparkling crystal compact is filled with either Lucidity Translucent Pressed Powder or a classic Estée Lauder Solid Perfume. 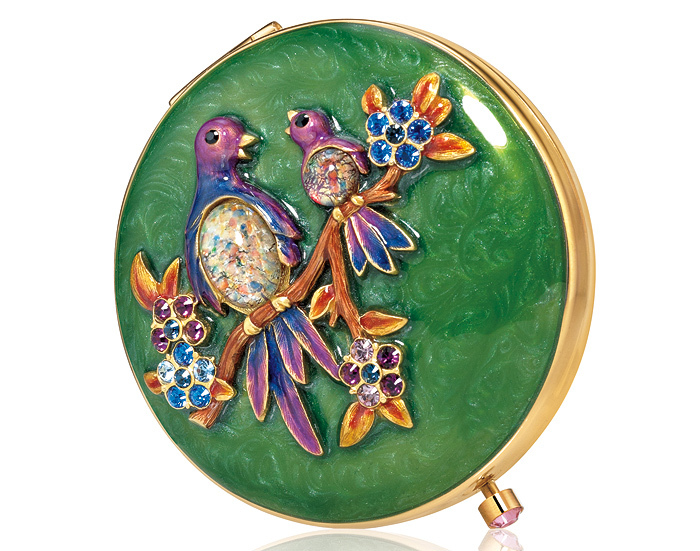 The Spring/Summer 2011 collection of compacts are available exclusively at the Estée Lauder counters at Harrods from March 2011 for a limited period only. Now excuse me, I’m off to root around down the back of the sofa. If I don’t find a spare £320 back there, I may at least find a chocolate button to console myself with. Unusually for me I like the cheapest one! The flower is just gorgeous. The second one – bluebirds, is just so lovely. The opal-effect of the large bird’s midsection makes me want to get a ring like that, or simply disembowl it…but that’d be almost a criminal act! I can definitely imagine owning one of these in the future and convince myself it’s an investment into a collector’s item. Yes! My favourite too – it’s just flippin’ stunning. I like the first one the best. I have seen these before but never realised how expensive they are?? Oh yes, proper limited edition, jewelled collectors pieces innit! The Christmas ones they do are LUSH too. Eye-wateringly expensive! Gorgeous blue isn’t it? I know… what we need is a money tree! I love the Radiant Bloom as the crystals are in my favourite colours – I’m typing this on a laptop which is the same colour as the crystals in the centre. Now, I’m wondering if I can really spend £95 on a powder compact. Probably not. But maybe. I love the birds most of all… those bellies… opals? gorgeous! 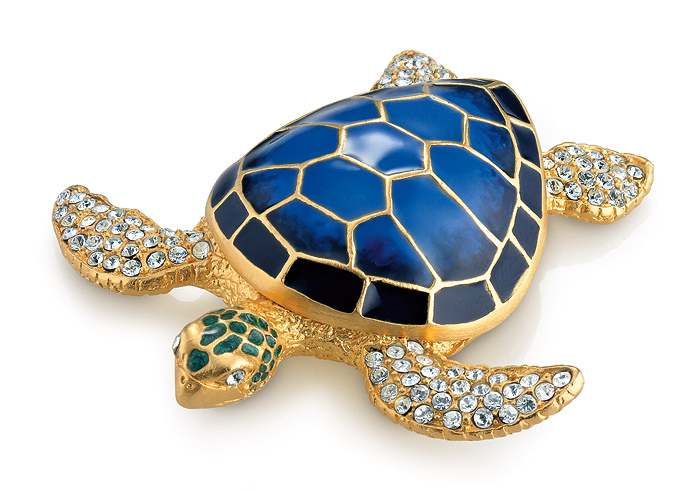 i wish i could afford to splash the cash on stuff like this, the turtle is so pretty! oh me too… will leave this one to the rich ladies I think! The birds are my favorite- but the turtle is lovely as well! I’m loving the new blog design, btw! It’s very chic and tidy. This sits well with my OCD, hahaha. OMG, that’s so luxurious looking.